Getting coffee with my friend Seth before going to my first class. You’ve gotta have coffee to start any day off good, right? Having my co-worker Anne make me a dessert she called “chocolate delight.” It was SO yummy! Going out to eat Indian food with my dad and my best friend Malia. Definitely a successful birthday dinner since Indian food is my favorite. Watching Grey’s Anatomy with Malia. I’ve missed our cuddle time. 🙂 I’m so glad that the semester has started back so we can resume watching movies and tv shows and reading in bed. Ha! And finally, having a perfect and wonderful phone conversation with my best friend Skidmore. Sunshine and One Lovely Blog. First off, thanks to Laura (http://cheesecakesummer.wordpress.com) for giving me not one but TWO awards in the last 2 weeks (apologies for not writing this post until now, but things have been busy. 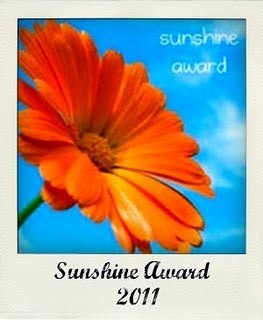 Anyway, I received The Sunshine Award and the One Lovely Blog Award, so thanks again Laura! 1) Thank the person who gave you the award – Thanks again Laura!! You’re SO AWESOME! My passion: At one time, it was writing. Then that faded away for a few years. However, now it seems to be back, so who knows. But I’ve got to include Psychology too because I love it so much, and it’s the career path I hope to take one day. Getting or giving presents? Giving. Favorite pattern: I don’t think I really have a favorite. Favorite day of the week: Thursday–because that’s Grey’s Anatomy night with my friend Nichole, and it’s usually the highlight of my week. Favorite flower: Red poppies. They remind me of the days when I was little that I’d run around in my mom’s wildflower patch behind our house. 10 Bloggers – Okay, I’m sure how to post links, so I’ll just include URLs, but all of you should check out these blogs because they’re pretty great! (http://somethingtoliveby.wordpress.com)–She’s new to WordPress and posts daily quotes that are really great! Bookstack (http://ravenousreader.wordpress.com)–Because we all love book reviews. 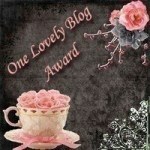 Andddd….now the One Lovely Blog Award! So, from looking at Laura’s post, there don’t seem to be any rules for this award. So I’m just going to stick with what Laura did, and I’ll list 10 things that I love. So here goes! Gilmore Girls and Grey’s Anatomy. They are my two favorite tv shows, and they make me so happy. Broadway musicals. I’ve seen Hairspray, All Shook Up, and Wicked on Broadway. I saw Wicked last August, and it was by far my favorite. Since I am a big fan of the Wizard of Oz (since I played Glinda when my childhood theater group did the Wizard of Oz back in 2007) AND since the songs are just AMAZING, it was my favorite without question! I’ve recently grown to really love scarves. I actually got 5 scarves this past Christmas, so I guess everyone was on the same wavelength or something. Yoga pants are now my pants of choice. This past weekend my mom and I went to buy me some yoga pants, and they are seriously SO comfy. I tried on jeans after wearing yoga pants for a few hours, and it just wasn’t the same. I’ll have to only wear them on occasion though since I don’t want the fact that they’re super comfy to make me sleepy. Sunsets are my favorite thing to photograph. I’m a grammar nerd, and I LOVE it! I’m going to see Marc Broussard in concert on February 10th, and I’m SO excited! I am a big texture person (in terms of foods and clothes). If foods have a weird texture or clothes aren’t relatively soft, then I’m not a fan. All kinds of music! Country, rock, pop, indie, acoustic, folk, alternative. I love it all! Ice cream. It’s pretty much my favorite thing in the entire world! There’s an ice cream place in Asheville called The Hop (they have their own homemade ice cream), and Mocha Oreo is currently my favorite flavor. It’s so so yummy! I probably should nominate some more blogs, but I need get ready for class in a while, so there’s not much time. Buttttt, you should check out the blogs that I mentioned above, because they really are great! Once again, thanks to Laura for make my day so awesome (from giving me these awards and just in general)! 1. At some point, you have to make a decision. Boundaries don’t keep other people out. They fence you in. Life is messy. That’s how we’re made. So, you can waste your lives drawing lines. Or you can live your life crossing them. 2. See once in a while, once in a blue moon, people will surprise you, and once in a while people may even take your breath away. 3. We have to make our own mistakes. We have to learn our own lessons. We have to sweep today’s possibility under tomorrow’s rug until we can’t anymore. Until we finally understand for ourselves that knowing is better than wondering, that waking is better than sleeping, and even the biggest failure, even the worst, beat the hell out of never trying. 4. I’ve heard that it’s possible to grow up – I’ve just never met anyone who’s actually done it. Without parents to defy, we break the rules we make for ourselves. We throw tantrums when things don’t go our way, we whisper secrets with our best friends in the dark, we look for comfort where we can find it, and we hope – against all logic, against all experience. 5. At the end of the day, the fact that we have the courage to still be standing is reason enough to celebrate. 6. No matter how hard you fight it, you fall. And it’s scary as hell. Except there’s an upside to freefalling. It’s the chance you give your friends to catch you. 7. As human beings, sometimes it’s better to stay in the dark, because in the dark there may be fear, but there’s also hope. 8. Communication. It’s the first thing we really learn in life. Funny thing is, once we grow up, learn our words and really start talking the harder it becomes to know what to say. Or how to ask for what we really need. 9. The people that are still with you at the end of the day – those are the ones worth keeping. And sure, sometimes close can be too close. But sometimes, that invasion of personal space, it can be exactly what you need. 10. And if we’re lucky, we realize, in the face of everything, in the face of life, the true dream is being able to dream at all. 11. We rely on superstitions because we’re smart enough to know we don’t have all the answers. And that life works in mysterious ways. Don’t diss the juju, from wherever it comes. 12. We’re friends, real friends. And that means, no matter how long it takes, when you finally do decide to look back, I’ll still be here. 13. Too often going after what feels good means letting of what you know is right. And letting someone in means abandoning the walls you took so long to build. 14. But sometimes, no matter how much you love someone, they just can’t love you back in the same way. 15. There are moments… moments that in a split second your life changes forever, and before you know it…you’re somewhere else. 16. You know as well as I do it’s not about what you look like, or your job, or how successful you are. It’s about having people in your life that you love and who love you…that’s all that matters. 17. When the worst case scenario comes true, clinging to hope is all we’ve got left. 18. Some people believe that without history, our lives amount to nothing. At some point we all have to choose: do we fall back on what we know, or do we step forward to something new? It’s hard not to be haunted by our past. Our history is what shapes us… what guides us. Our history resurfaces time after time after time. So we have to remember sometimes the most important history is the history we’re making today. 19. Change; we don’t like it, we fear it, but we can’t stop it from coming. We either adapt to change or we get left behind. And it hurts to grow, anybody who tells you it doesn’t is lying. But here’s the truth: the more things change, the more they stay the same. And sometimes, oh, sometimes change is good. Oh, sometimes change is everything. 20. You don’t have to be tough every minute of every day. It’s okay to let down your guard. In fact, there are moments when it’s the best thing you can possibly do – as long as you choose your moments wisely. 21. It’s good to be scared. It means you still have something to lose. 22. The scars you bear are the signs of a competitor. You’re in a lion fight. Just because you didn’t win doesn’t mean you don’t know how to roar. 23. Don’t wonder why people go crazy. Wonder why they don’t. In face of what we can lose in a day, in an instant, wonder what the hell it is that make us hold it together. 24. The ties that binds us are sometimes impossible to explain. They connect us even after it seems like the ties should be broken. Some bonds defy distance and time and logic; Because some ties are simply… meant to be. 25. And the only way to get rid of a shadow is to turn off the lights, to stop running from the darkness and face what you fear, head on. 26. You never know the biggest day of your life is going to be the biggest. The days you think are going to be big ones, they are never as big as you make them out to be in your head. It’s the regular days, the ones that start out normal. Those are the days that end up being the biggest. 28. All the pain and the fear and the crap, maybe going through all that is what keeps us moving forward. It’s what pushes us. Maybe we have to get a little messed up before we can step up. 29. Sometimes the past is something you just can’t let go of. And sometimes the past is something we’ll do anything to forget. And sometimes we learn something new about the past that changes everything we know about the present. 30. The universe is funny that way. Sometimes it just has a way of making sure we wind up exactly where we belong. 31. No matter how high the stakes, sooner or later you’re just going to have to go with your gut. And maybe, just maybe, that’ll take you right where you were supposed to be. 32. You have to go back to the beginning to understand the end. 33. Sometimes it happens in an instance. We step up, we see a path forward. We see a path and we take it. Even when we have no idea where we’re going. 34. If you can think of a reason; any reason at all why the universe is so screwed up and random and mean; now would be an amazingly good time to tell me because I really need some answers.